Producers in Thomas County are eligible to apply for 2016 Livestock Forage Disaster Program (LFP) benefits on native pasture or improved pasture. County committees can only accept LFP applications after notification is received by the National Office of qualifying drought or if a federal agency prohibits producers from grazing normal permitted livestock on federally managed lands due to qualifying fire. Eligible livestock producers must complete a CCC-853 and the required supporting documentation no later than January 30, 2017 for 2016 losses. Additional Information about LFP, including eligible livestock and fire criteria, is available at your local FSA office or online at: www.fsa.usda.gov. We are pretty much past the point of being able to establish winter forages with our drought persisting. We generally don’t feed hay until Thanksgiving, but our cattlemen have been feeding hay for a while now. Here is a great article by Glenn Selk, Oklahoma State University Emeritus Extension Animal Scientist. Higher quality forages are fermented more rapidly in the rumen leaving a void that the animal can re-fill with additional forage. Consequently, forage intake increases. For example, low quality forages (below about 6% crude protein) will be consumed at about 1.5% of body weight (on a dry matter basis) per day. Higher quality grass hays (above 8% crude protein) may be consumed at about 2.0% of body weight. Excellent forages, such as good silages, or green pasture may be consumed at the rate of 2.5% dry matter of body weight per day. The combination of increased nutrient content AND increased forage intake makes high quality forage very valuable to the animal and the producer. With these intake estimates, now producers can calculate the estimated amounts of hay that need to be available. Using an example of 1200 pound pregnant spring-calving cows, let’s assume that the grass hay quality is good and tested 8% crude protein. Cows will voluntarily consume 2.0% of body weight or 24 pounds per day. The 24 pounds is based on 100% dry matter. Grass hays will often be 7 to 10% moisture. If we assume that the hay is 92% dry matter or 8% moisture, then the cows will consume about 26 pounds per day on an “as-fed basis”. Unfortunately we also have to consider hay wastage when feeding big round bales. Hay wastage is difficult to estimate, but generally has been found to be from 6% to 20% (or more). For this example, let’s assume 15% hay wastage. This means that approximately 30 pounds of grass hay must be hauled to the pasture for each cow each day that hay is expected to be the primary ingredient in the diet. Big round hay bales will vary in weight. Weighing a pickup or trailer with and without a bale may be the best method to estimate bale weights. 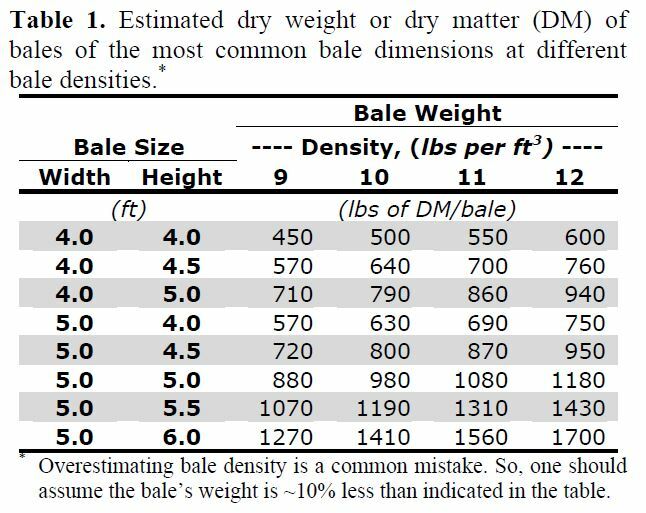 There are other calculations that can be helpful in estimating hay bale weights as seen in the chart below. Visit What Does A Round Bale Weigh to read more information from UGA Forage Specialist Dr. Dennis Hancock. It’s literally been a few generations ago that we last dealt with screwworms. There has been a reinvasion in South Florida, and an eradication program is underway. UGA Extension Livestock Entomologist Dr. Nancy Hinkle has good information on the current situation. In late September the USDA’s National Veterinary Services confirmed that New World Screwworms had been found in deer on Big Pine Key in south Florida. Additional screwworm-infested animals have been located in the same area since. Screwworms will lay their eggs on any wound in an animal–even an area as small as a tick bite. They are unusual in that the maggots feed only on living flesh (while other types of maggots consume necrotic tissue). Once the maggots have gotten as big as they are going to get, they crawl out of the wound, fall to the ground, burrow into the soil and pupate. A few days later the adult fly will emerge from the pupal case, seek a mate, and start the life cycle all over again. Screwworms were a scourge of the Southeast from the 1930s to the 1960s. Cattlemen funded an eradication program to eliminate screwworms using the sterile insect technique, successfully eliminating screwworms from the Southeast in 1959. They were eradicated from the rest of the U.S. in the 1970s, and by the mid-80s screwworms had been eradicated from all areas north of Panama, where they have been maintained since. South American countries still have thriving screwworm populations, so risk of reintroduction persists. This is a reportable disease, so veterinarians are being particularly vigilant. Cattlemen can watch their animals to ensure that screwworms do not develop in their herd. Other livestock such as goats, horses, swine, etc. can also be infested by screwworms, so should be checked regularly. Back in the 1950s screwworms killed over 60% of white-tailed deer fawns born every year. Hunters may want to keep a ziploc bag with them in the field to scoop maggots out of wounds on deer they kill, so they can be submitted for identification. Pet-owners should keep an eye on their animals to avoid screwworms infesting their pets. Contact your veterinarian to have any suspicious maggots checked out. Any suspect maggots should be put into a container of alcohol and submitted to the County Extension office. Don’t just scrape the maggots off on the ground and let them crawl away! We want to eliminate these pests before they have a chance to re-establish in Georgia. Screwworms can be treated and the animals will recover fully, if the infestation is caught in time. Again, other types of maggots can be found in wounds, but screwworms are the only maggots that feed on the living tissue and enlarge the wound. Screwworms cannot live in dead animals. The University of Georgia will be glad to identify any maggots of concern. We have several factors working in our favor. (1) Fortunately the screwworm infestation is hundreds of miles south of Georgia, so the risk is small. However, we realize that thousands of vehicles move from Florida through Georgia every day, including many with pets or other animals. When these stop at service stations, restaurants, or welcome centers there is the risk that any hitch-hiking maggots could disembark and try to make a home in Georgia. (2) We’re moving into winter, so it will soon be too cold for screwworm flies to survive in Georgia. (3) And we have a very vigilant network of veterinarians who are attentively watching to ensure none of their patients have screwworms. We can anticipate that Florida will eradicate screwworms this fall and by the time spring begins to warm Georgia, there will be no risk of screwworms moving north to our state. If you want to know more about screwworms (and how much we don’t want them back in the Southeast), talk with someone whose family had cattle back in the 1950s. They can tell you about digging maggots out of calves’ navels and smearing insecticides in dehorning and branding wounds. Florida has lots of good information about screwworms on their website at http://www.freshfromflorida.com/Divisions-Offices/Animal-Industry/Consumer-Resources/Reportable-Animal-Diseases/New-World-Screwworm. Grass tetany, also known as grass staggers, magnesium (Mg) tetany, hypomagnesemia, and wheat pasture poisoning, is a nutritional disorder caused by either 1) an inadequate amount of dietary Mg, or, 2) other mineral related factor that is preventing (antagonizing) dietary Mg from being properly absorbed or utilized. Magnesium is considered a macro mineral and is needed in beef cattle diets to insure proper growth, reproduction, and metabolic function. When dietary Mg is low or utilization is inhibited, neuromuscular function becomes impaired and leads to the clinical symptoms of staggering, muscle twitching, convulsions, and in severe cases, can lead to death. This disorder is most common during cool, cloudy, and rainy weather, and frequently occurs when cool weather is followed by a warm period. Mg is essential, especially during lactation – Spring calving cows are highly susceptible to grass tetany because they reach peak lactation (require increased amounts of Mg) during the same time as the spring green. This onset of abundant lush forage is associated with decreased amounts of forage Mg. Older cows are more susceptible because they cannot mobilize Mg from reserves in the bone as quickly as younger cows. Not consuming enough – There may be a palatability issue, especially when Mg is increased in the mineral. However, cows typically do not voluntarily consume as much mineral this time of year. High-Mg mineral if fed year-round – Sometimes, the strategy is to put high-Mg mineral out all year as an “insurance policy” – High-Mg mineral is only needed during the short period of time that grass tetany may occur. Feeding the miner year-round may condition cattle to not consume enough during the time they really need it. Not enough salt – Magnesium transport across the rumen wall can be reduced if 1) there is not enough salt in the diet, and, 2) if there is too much K in the diet. Collectively, too much K and too little salt can cause grass tetany, even if Mg intake is adequate. Know exactly what cattle are consuming – Do the math based on how much mineral you’re putting out, how many cows, and how fast it is being consumed. Calculate the mineral on an oz/hd/d basis and determine whether or not their consumption meets requirements. 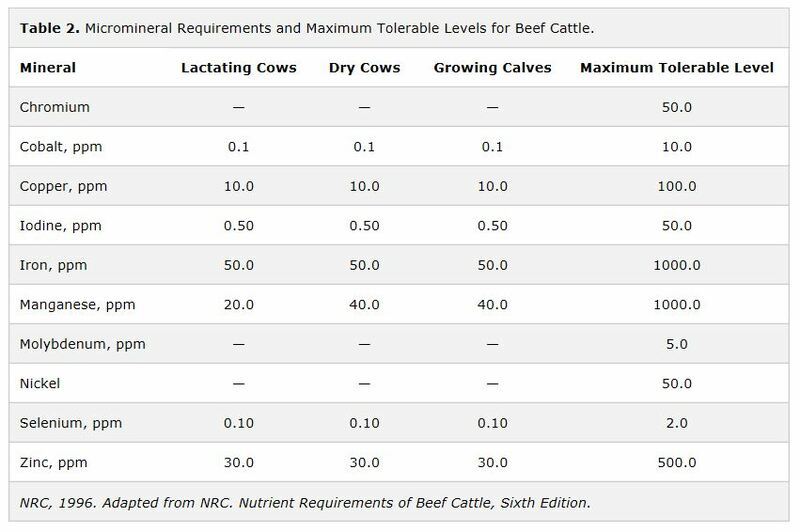 Table 1 illustrates calculated consumption based on different feeding rates and herd sizes. Add salt – In addition to increasing the mineral intake, additional salt will ensure that the sodium requirement is being met and thus, help to maximize absorption of Mg. DO NOT DO THIS IN PLACE OF HIGH MAG, rather in addition to. This can be as simple as putting out plain white salt blocks. Table 1. Calculated weekly consumption amounts for different feeding rates and herd sizes. To begin the process of calculating the hay inventory needed for the winter, a producer does not need to do math! The first step is simple, send a forage sample in to a certified lab to determine the forage quality. The cost of this analysis is minimal and the lab does the math for you. The quality of the forage will determine the amount needed during the winter feeding period. In the end, producers need to think about their current hay inventory and start calculating for this coming winter. 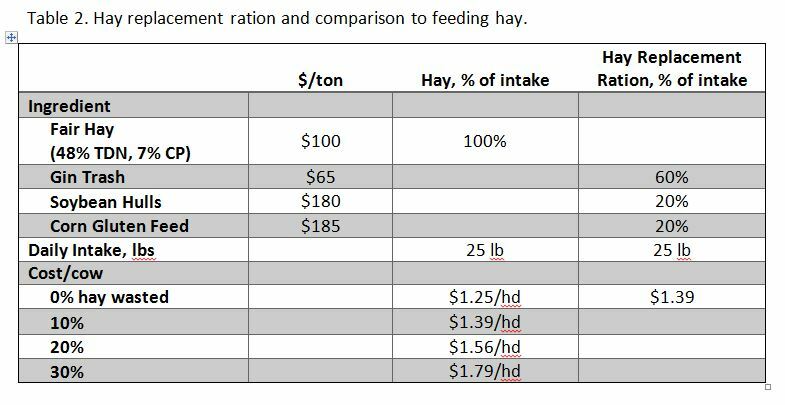 With current grain prices, a concentrate supplement may work to stretch hay more cost-effectively. Either way, a producer needs to plan their winter feeding program to avoid overpaying for any forage or supplement when supplies get tight. I have heard several comments that producers are cutting P out of their mineral, because they are using poultry litter as fertilizer. Although there is potential to improve the P levels in forage with little, assumptions are being made on the ability of the plant to make the P available to the animal. This is one of the examples of how we need to make sure we’re cutting cost and not cutting corners in our production system. In fact, some producer may cut minerals out all together to help cut cost, because performance does not appear to change. Short term maybe, but the long term consequences may be more costly. If you look at a cow/calf annual budget, minerals represent only about 3.5%; a very small cost to insure health and performance. 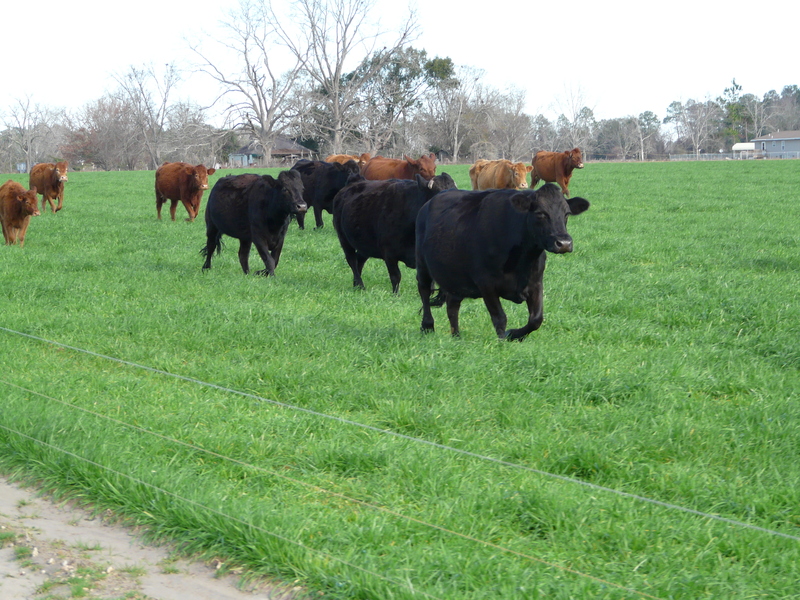 The greener pasture we’re seeing may reduce the feed bill, but we need to remember many forages in the Southeast are deficient in several minerals. Although minerals represent a small cost in total budget, we can cut some extra expenses by taking a second look. We can learn a lot by getting our forages tested and reading the mineral tag. Forage Testing is the cheapest initial investment you will make. We must have a starting place if we want to know what minerals, and how much we need in our minerals. Calcium and Phosphorus – These are two macro minerals that need to be addressed together due to their interaction in the biological processes. On well managed pastures, forages are typically close to meeting the requirement of brood cows, but are deficient for growing cattle. However, almost as important as the quantity of these is their ratio. The ratio of Ca to P needs to be greater than 1.5:1. Sodium and Chlorine – More commonly referred to as salt, these minerals are the only ones cattle will crave and need to be offered daily. Magnesium – This is a crucial mineral when cattle are transitioning into and during lactation. Generally, extra Mg is only needed during this lactation while grazing lush pastures. Often times, producer do not realize they are feeding Mg unnecessarily through the summer. Sulfur – Although S is essential, it is not usually limiting in the diet. However it may be present in mineral mixes due to inclusion of other minerals as sulfates. The concern with S is its antagonism with copper, selenium, and the B vitamin thiamin. Therefore, it sometimes is necessary to feed additional copper and selenium to compensate this antagonism. Micro minerals – These mineral needed in smaller amounts such as copper, zinc, and selenium. Most forages are deficient in these minerals and need to be offered as a trace mineral pack. We can learn a lot by reading the mineral tag. Usually, the mineral company makes mixes to fit general needs. Some of these may fit your operation; however, there may be times your’re paying for ingredients you don’t need an/or not getting what you need. Check for the right mineral levels. Going back to our forage test, make sure you are getting the appropriate levels of each mineral and Ca:P ratio. If a supplement is being used, make sure you consider the mineral content. For example, if distiller’s grains or corn gluten feed is being utilized, P should be adequate, but Ca should be supplemented to maintain the proper Ca:P ratio. Look for additives. Often additives such as ionophores (Rumensin, Bovatec), antibiotics (chlortetracycline, GainPro), and fly control compounds (IGR) are administered through mineral mixes. Although these may improve performance, they may not be wanted in your operation and come at additional cost. If the local feed store doesn’t provide the mineral that fits your production system, many will work with you to formulate a custom mix to provide the nutrients you need. 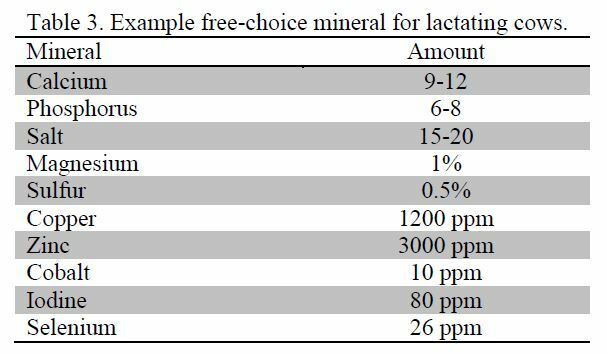 The table below presents an example of a free choice minereal for lactating cows grazing in bermuda pastures. Remember, our goal is to cut cost and not corners to survive in the cattle business. For a complete description of both macro and micro please refer to the UGA publication Mineral Supplements for Beef Cattle.